The price of entry into the challenging world of Demon's Souls has been cut in half by a 10-story tall demon knight. When Demon's Souls was brought to North America back in October 2009, even Atlus, its publisher, didn't expect the level of success it had, nearly quadrupling sales expectations after only four months. It looks like that sales success continued throughout 2010, as Atlus has announced that Demon's Souls is now a proud member of Sony's Greatest Hits line and has permanently slashed its price. The incredibly challenging, yet vastly rewarding game that once set back gamers $60 is now a cool $29.99. The red label Greatest Hits line is reserved only for certain games that meet its requirements, which in regards to the PS3 are said to be sales of 500,000 copies or more after being on the market for longer than 10 months. It's been almost a year since Demon's Souls' release outside of Japan, while the game only recently made it to Europe on June 25, 2010. 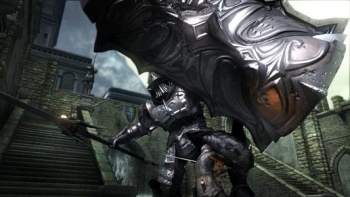 Those that want the full Demon's Souls experience should strike while the iron is hot, because Atlus has made it known that it will have to end support of its multiplayer servers at some point in the future, though not until March 2011 at the earliest with more continuations possible. Atlus planned to end server support just six months after release, but outlandish success inspired the company to keep the servers going. Demon's Souls is a great single player game, but its multiplayer aspect is something that every player should experience. Even if you don't want to hunt alongside friends or hunt them down for your own gain (both are possible), you still can be treated to visions of how other players died and receive warnings and hints. Now at a bargain price, action-RPG fans that are ready - and please, make sure you're absolutely, positively ready - should give Demon's Souls a go. Once I figured it out, it became one of my favorite games of all time.